- On Saturday I headed to the Green Mountains to start chipping away at the dozen or so New England 67 highest peaks as well as the North East 115. I have only hiked Mount Mansfield in Vermont so I was excited to see what the Green Mountains had to offer. 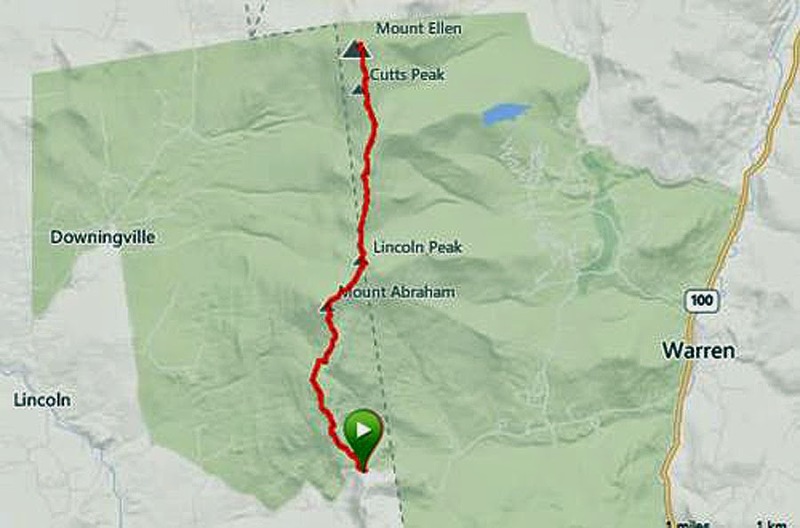 - My first stop was Lincoln Gap where I would hook onto the Long Trail north over Mount Abraham to Mount Ellen and back to Lincoln Gap. The drive to Vermont was pretty easy, 93 north to 89 north, then back roads, some nice, some gnarly and then up the steep Lincoln Gap Road. The last two miles up this road to the gap was excessively steep, steepest road I've been on yet! - The hike itself was not what I expected. The trail had decent footing and was never steep. It was a gradual ascent up to Mount Abraham. I thought the peak of Abraham would be bigger and more open but it still had really good views west to New York and east to New Hampshire. - The summit of Abraham is about 2.5 miles north of Lincoln Gap, from here the trail follows the ridge for 3.0 miles or so over the peaks of Lincoln, Nancy Hanks, and Cutts Peak before heading up to the next 4,000 footer, Mount Ellen. 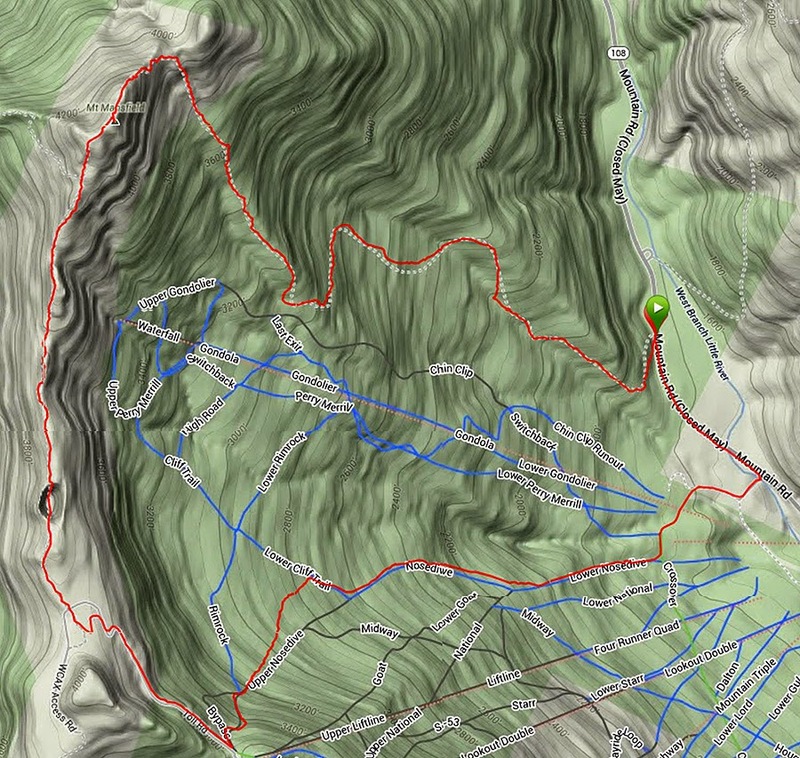 The walk has minor ups and downs and the elevation always stays between 3,700 to just below 4,000 feet. 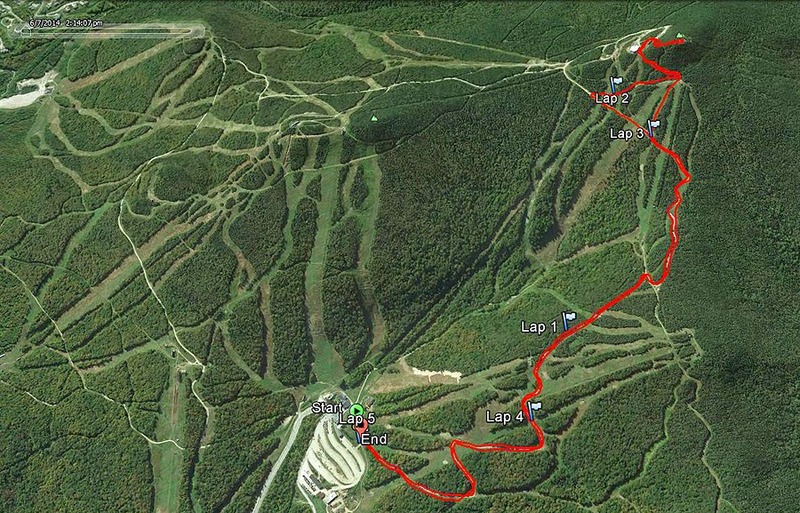 - The trail every mile or so popped out at a ski lift for the Sugar Bush ski area. Since almost all of the trail was in the woods, this was a welcome surprise and offered some views. I made it to the summit of Mount Ellen, marked by a small cairn in the woods and some pray flags around 10:30ish. Just north of the summit is another ski lift that had the best views of the day. The sky was a little hazy in the mid morning so I couldn't make out the White Mountains but I could make out the Dix Range, Great Range, Rocky Peak Ridge, and Mount Whiteface in the Adirondacks. Oh, how I miss the Daks! 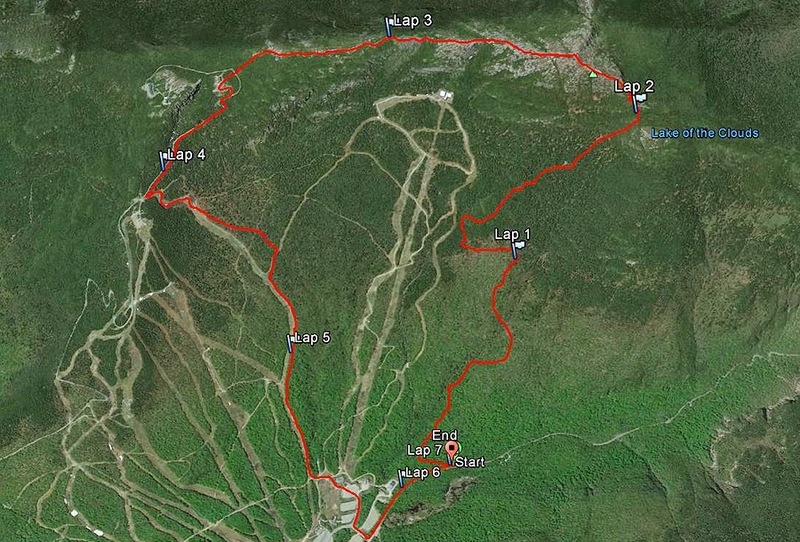 - The hike back went well enough that I decided to head south and hike Killington Peak. I didn't feel like hiking in the woods so I drove over to the ski area and just hiked up one of the ski trails. It was a nice change of pace and the sky was a vivid blue with puffy clouds floating by making the hike up enjoyable. The gondola rides stopped at 2:30ish so when I reached the summit there were only hikers up there. The final stretch from the ski slope to just beneath the summit is a bunch of stairs, it looks like they stole the specs right from that staircase you have to walk up on the final stretch to Mount Washington's summit once topping out of the Tuckerman Ravine Trail! - Views from the top where pretty good, there's Little Killington peak and Pico Peak on each side. The summit has a tower and a bunch of satellite dishes, the tower was closed off so I couldn't get in it. - The hike down the slopes went pretty fast and was really enjoyable. I made it back to the car before 4pm, not a bad day hiking in the Green Mountains! - Sunday was a continuation of Saturday, perfect temps with big puffy clouds floating in by the afternoon. In the morning I drove over to Camel's Hump Road to the Monroe Trailhead to meet up with Erin for a quick hike up Vermont's third highest peak, Camel's Hump. Erin, who recently moved to Vermont would be hiking her first 4,000 footer in New England. She's an avid mountain biker and trail runner having biked and ran in Colorado and Utah. 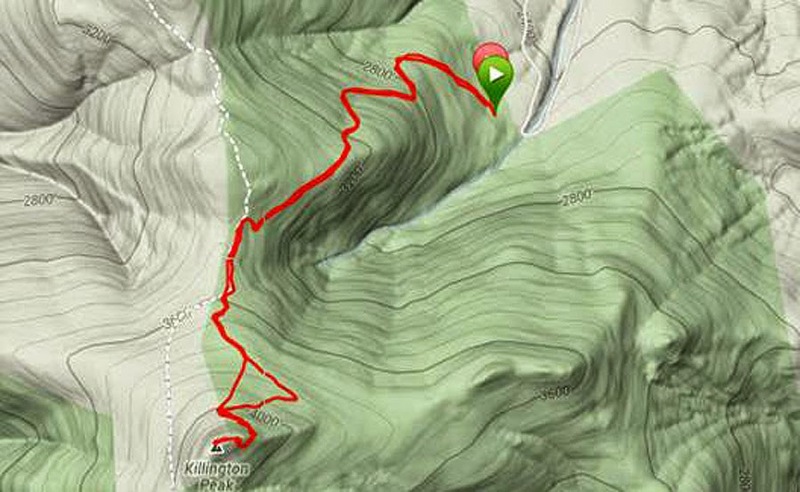 - We set off just after 8:30 a.m. and hiked at a good pace enjoying the mostly quiet trails up to the summit. Camel's Hump is an extremely popular peak which see a lot of foot traffic on the weekend. If you want to beat the crowds up to the summit get on the trail early! - Just like Saturday, I was surprised at the easy grade and decent footing. Closer to the top the trail got a little more rugged with some slab and rocks but 75% of the trail was easy on the feet. - It was an enjoyable hike up to the summit as Erin and I chatted away. As we approached the summit we started running into more and more hikers, and more and more dogs, I think it was bring your dog to Camel's Hump day as we saw well over a dozen dogs during the hike. - Camel's Hump summit is a bald summit with 360 degree views. Lake Champlain and the Adirondacks were in view to the West, Mount Mansfield to the North, Ellen and Lincoln to the South, and views of the White Mountains to the east. It was hazy out so the Whites were not well visible. - There was no wind on the summit, and unfortunately with the warm temperatures that brought an onslaught of numerous annoying bugs driving us back down into the trees after a short break. - The hike down was filled with lots of people and many happy dogs hiking up. The lower portion of the trail passes through a nice birch forest which we both agreed would make for some pretty stellar hiking in foliage season. - We made it back to the trailhead at 11:30, which was now, along with the lower lot jammed packed. It was a quick and fun morning hike and it was great to meet Erin and talk about running, hiking, and biking. I picked up some tips about running from her which will definitely help me with my seven hour Pemi Loop goal! - As I headed back to jump on 89 south for the long drive home I had a decision to make. Do I go home and cut the grass or do I just drive over the highway and keep heading north to Stowe for an afternoon hike up Mount Mansfield. Mount Mansfield it was! - I jumped onto the Long Trail south around 12:30ish. The Long Trail up to the ridge doesn't mess around, it starts gaining elevation quickly as it's a steep trail. I was a little slower than usual gaining the ridge but once I hit the Adam's Apple / Chin Col and saw the views I felt much better and zoomed up the exposed slab section on the way to the summit. The summit was crowded as usual but I found a place off to the side to relax and refuel. From the summit I continued south on the Long Trail over to the auto road, which I walked for about five minutes before hooking onto the ski slopes and the Haselton Trail. - I ended up jumping off the trail and taking the ski trails down before the final third of a mile road walk back to the car. - It ended up being a really great day in the Green Mountains. The drive home via 89 was really enjoyable and scenic, while the drive along 93 through NH, MA, and then 95 in RI was smooth sailing the whole way. I made it home just in time for the first pitch of the Red Sox game, not a bad end to a great weekend! In the afternoon some big puffy clouds started floating in! Golden Retriever on the Long Trail! Long trail lean-to just north of Lincoln Gap, this is where I left a message in a note pad for my thru-hiker friend, unfortunately she's an A.T. hiker, and this section of the Long Trail is not on the A.T. Stupid me! This went on for almost a quarter mile! The Jeep makes and appearance! look at this happy goofball enjoying himself! Green was the theme of the weekend! This is the ultimate way to go green! One of my best friends grew up on Vermont and he loved it. This definitely makes me want to visit and hit those trails..